While tattoos come in all shapes, sizes, and designs, some have a deep meaning behind them beyond just the style. 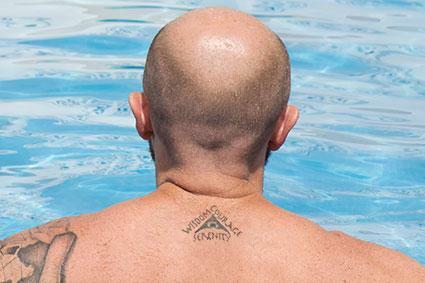 Sobriety tattoos signify an important moment in an individual's life and can be powerful symbols. Your recovery from alcohol is a very personal process, and in several cases, your tattoo is as well. There are a few tattoo ideas that are universal, however, for recovering alcoholics. Recovery isn't a sprint: it's a marathon. It is a lifelong battle with many ups and downs. While you might stumble, you are also succeeding because you have made the choice to live a sober life. 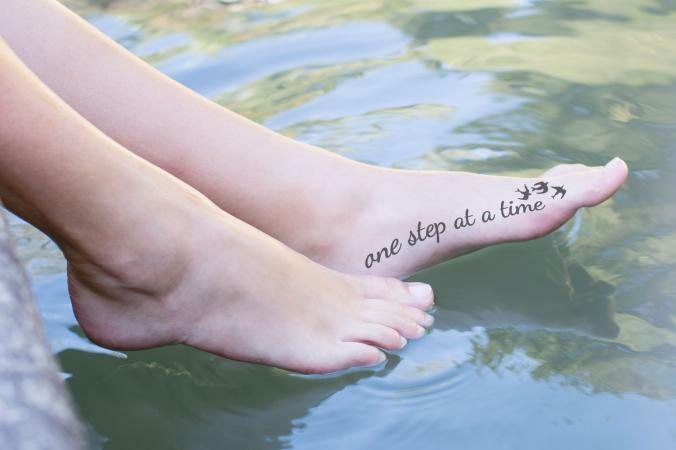 The phrase 'one step at a time' can remind you that every step towards recovery is a step in the right direction. While you can get this tattoo anywhere, like the forearm or calf, adding this to the foot (as shown above) adds irony and fun to the tattoo. 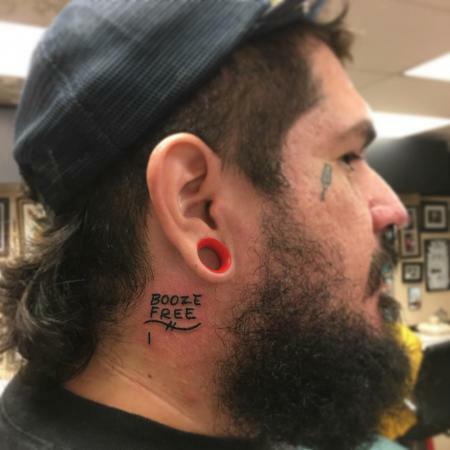 If you are proud of your accomplishment and aren't shy about discussing your past, you can get a tattoo that helps you to mark the days, months, or even years that you have been free of alcohol. This is a progressive tattoo that will build as you move forward, similar to the coins that can be earned for Alcoholics Anonymous (AA). The tattoo can grow to be fairly large, but can also stay a small reminder. For example, this could work in a discrete area like the inside of your wrist (covered with a bracelet or watch), along your foot, or other relatively hidden area. You can even get this one behind your ear. However, this could also explode into a full back piece using elements to commemorate your alcohol free lifestyle. If you want to document the exact time you made the choice to fight your addiction, a clock with a date can be a great reminder of when you made your courageous decision. 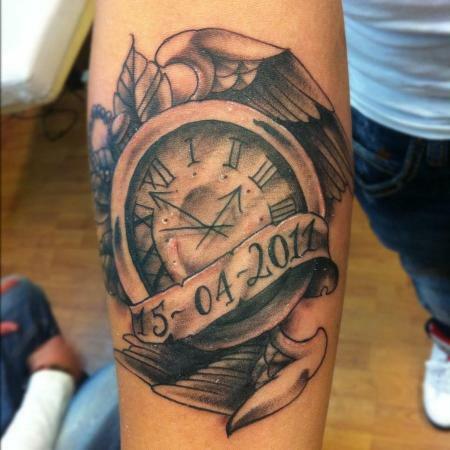 This tattoo can take many shapes and sizes, but since a clock with a time and date is fairly discreet, you can choose to make this a larger tattoo. This will allow you to get fairly decorative with the artistic elements in your recovery piece and still have a great reminder of your choice for a different path. The bicep, forearm, and even the calf can work well for clock pieces. 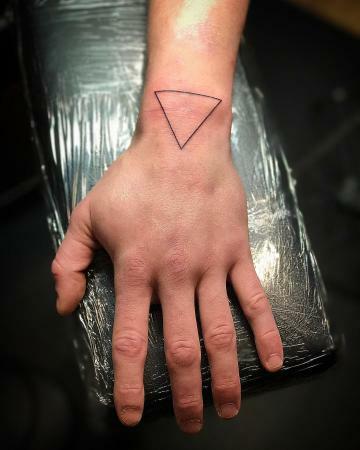 Another tattoo you might find on recovering alcoholics is the triangle. This is a symbol of an equilateral triangle, and it may also feature a circle around the triangle. The whole symbol is from AA. The triangle represents the legacies of AA, which include unity, recovery, and service. The circle is meant to represent AA itself or the community that is available to support you through your journey. Placement of the triangle symbol is very diverse given the simplicity of the logo. You could choose to tat this as a standalone piece or a hidden symbol with a larger piece or sleeve work. Whatever type you choose, this logo can help to remind you of your determination and strength on the rough days. Another important aspect of recovery is the serenity prayer. These few words help to remind the person of both his or her limitations and strengths. Recovery can be a time of turmoil, grief, and even despair. These words remind of the wearer of the ultimate goal of peace and a more stable life without alcohol. The words are also associated with AA and the 12-step program. The serenity prayer is rather large and will need a bit of space to make it clear and readable. Therefore, areas like the bicep, chest, shoulder, or thigh might work best for this calming tattoo. If you don't want to commit to the whole serenity prayer, you can just pare it down to the most important bits: serenity, courage, and wisdom. On a recovering alcoholic, this might be seen in the symbol of a triangle, surrounding a triangle, or even in an infinity symbol. This helps to bring in a person's commitment to sobriety through the 12-step program and AA through one design. It also reminds an individual to find the calm through the turmoil. This tattoo works well for those that don't want to commit to a bigger piece and can fit into pretty much any area. Given the significance of the piece and its importance, it will typically be found on an area visible to the viewer, like the forearm, inside of the wrist, back, or side of the chest. Much like the sobriety coins that help those that have chosen to fight their addiction to alcohol, a recovering alcoholic tattoo provides a permanent reminder of a significant choice in a person's life: the decision to give up alcohol. These tattoos come in different styles, and placement is pretty much limitless - depending on the design you choose. A larger design will require more area, but a small design can fit neatly in tight spaces such as the wrist. One of the most important things to consider when deciding on this type of tattoo is how visible you want it to be to others. Would you prefer that this to be a private moment you are commemorating for yourself? Or, are you comfortable discussing your recovery? That's really the only limit to how much skin you can cover with your recovery tattoo. For example, some people might choose to make their recovery tattoo into a large work, adding to the tattoo with each passing year. However, others might get a small design that is a personal reminder for just themselves. As with any other tattoo, you should consider all the pros and cons of getting a recovery tattoo. Many people that choose to get one feel that the tattoo serves as a permanent reminder of the commitment to a stable, sober lifestyle. Additionally, looking at the chosen wording or symbol can help them get through moments of weakness or reach out to a sponsor. There are some cons to consider with this type of tattoo as well. Some recovery centers point out the permanence of the tattoo for something that may be an up-and-down road. If you choose to get a recovery tattoo with the date of your sobriety, if you were to fall off the wagon, this could serve as a constant reminder of when you stumbled. This may be discouraging to some on the road to recovery. Choosing to get your tattoo in a visible place could also bring about questions you might not be ready to answer. For example, would you be prepared to tell your boss about your tattoo if he or she were to ask? Commemorating your victory over alcoholism with a tattoo can help to serve as a reminder of the battle you are fighting and winning. However, keep in mind that relapses are common. This concerns professionals in recovery because a tattoo can serve as a permanent reminder of a relapse and might hinder recovery. Therefore, weigh the pros and cons carefully before getting that recovery tattoo. Whether you choose to get the ink or not, remember your courageous decision, and you will be victorious.